- Combine the sour cream, horseradish and beetroot juice in a mixing bowl. Stir in the herring, beetroot and cucumber salad. Toss to coat evenly with the sour cream mixture. Season with salt and pepper and refrigerate until needed. - To make the sandwiches, butter the bread to the edges, top with the lettuce leaves and cut each slice in half. 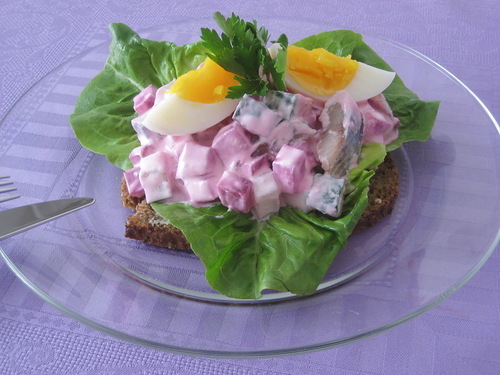 - Leaving one curl of lettuce visible on each slice, spoon the herring salad over the lettuce. Arrange three slices of egg on each sandwich. - Season the sandwich with salt and pepper. Garnish each sandwich by tucking a parsley sprig under the egg slices.